I rotated the sketch 90 degrees to the right. This is the inside of the card. I am continuing to try to bring more to the center of the card. 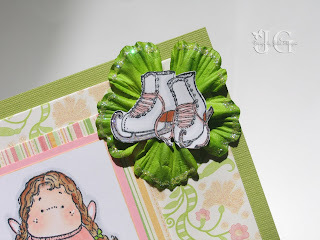 I added the skates to the center of the flower. I actually considered making a charm out of them and hanging them from the flower, but went another way. I used the skater as this week we have a special occasion. Friday is my daughter's Spring Show for her figure skating club. It is also her birthday (the big 12), so it will be a big day. I made this card to give to one of the parents in the skate club who has been such a huge help this year, just wanted to find a special way to say thanks. 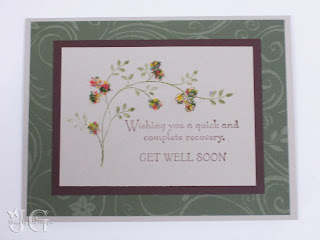 I will be back tomorrow with the Blogger's Challenge card, so check back then. Sharon Caudle shared some interesting information today. The question was raised, "What is the story behind Tilda, why does she have wings, and why does she have no mouth?" Sharon took the bull by the horns and asked Magnolia directly. Their response was that all the angels have wings, but some of them don't show them because they are hidden on their backs (so Tilda's are angels - how great is that!). As for the lack of a mouth, it is because angels speak with their heart, so there is no need for a mouth. I tell ya, now I just love them all the more! 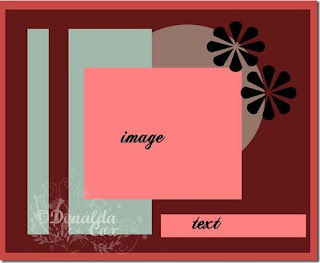 So, the Just Magnolia challenge for this week is to use Pink and Green. This is the card I chose for this challenge. I am also submitting this for the Copics Creation Challenge #2 which is coloring jeans. 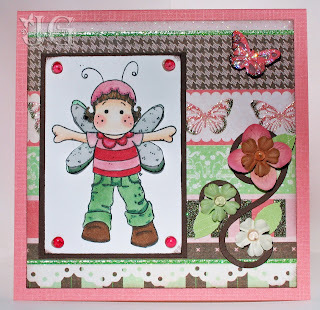 Embellishments: Prima’s, Dew Drops, Martha Stewart butterfly punch, Flower and Vine die cut, Stickles. 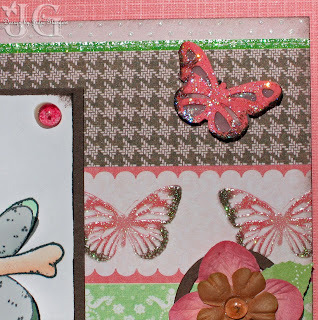 I used Stickles on the butterfly to match the glittery butterflies in the paper. I must give credit where credit is due. 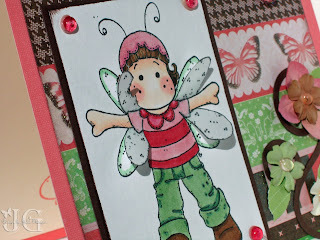 I took the idea for the vellum wings from Claudia Rosa at Pretty Pressings. 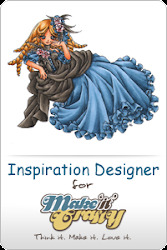 Thank you, Claudia, for sharing your awesome talent and amazing ideas. I cut out the wings and part of the sleeve, colored the sleeve and just outlined the wings, and glued the sleeve onto the picture. Paper: Always Artichoke, Perfect Plum, K&CO. I used watercolor crayons for the flowers and the cross behind the saying. 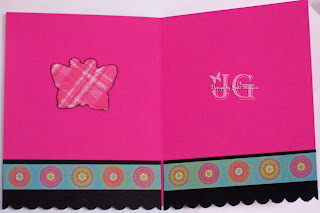 I used embossing folders to enhance the designer paper. Go find your Mojo and start stamping! I think this is called killing 3 birds with 1 stone. 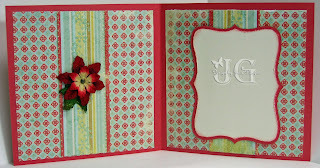 Embellishments: Prima’s, Martha Stewart Branch Punch and scallop border punch, charm from stash, Top Note die cut for inside of card. Other notes: Distress tool to distress paper edges. I remembered to decorate the inside of the card. I love how this really completes a card. 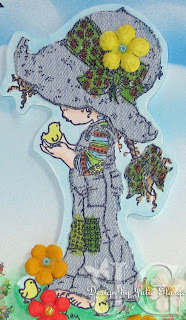 Embellishments: Prima’s, Stickles, Pretties half pearls. Other Notes: I just received my order from Magnolia-licious, and Diana included a few goodies including the rik rak and the silk flowers. 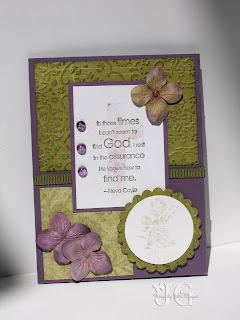 The frame around Tilda is fashioned with a Sizzix border die cut. If you click on the close-up picture, the enlarged version really shows the bling. The flowers and Tilda's skirt have Stickles that really shine. The white background is also shimmery paper. I can't wait for the next challenge. This was a lot of fun! 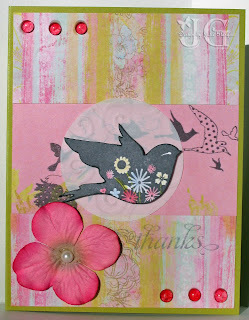 Oddly enough, this card was a challenge for me, not the sketch but what I chose to use. It was very out of my comfort zone, but I really like the result. 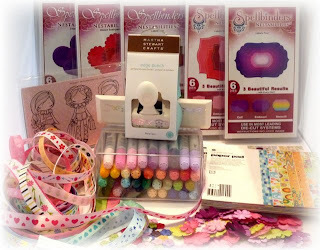 Katharina from Stamping with a Whiff of Joy is offering 2 chances to win the Whiff of Joy Spring Kit! 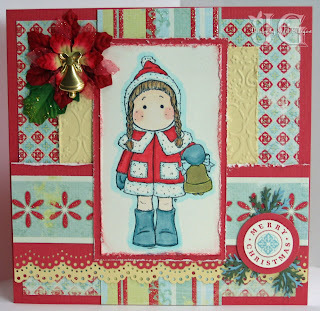 Go check Stamping with a Whiff of Joy and enter for your chance to win. 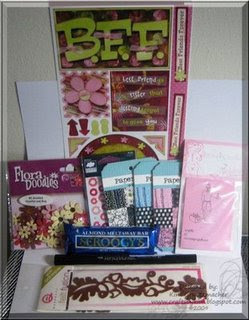 Debbie from Passion for Crafts is celebrating her blogoversary. She is offering some great blog candy. 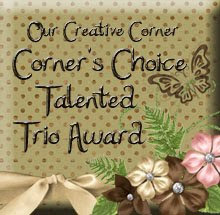 Go check out Debbie's blog and enter for your chance to win. 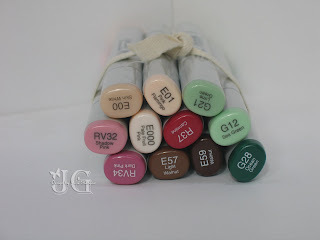 Kim from Crafts by Kim is offering blog candy for her blogoversary. 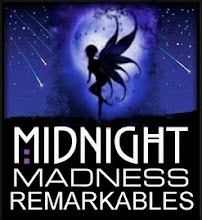 Go check out her blog and enter for your chance to win! 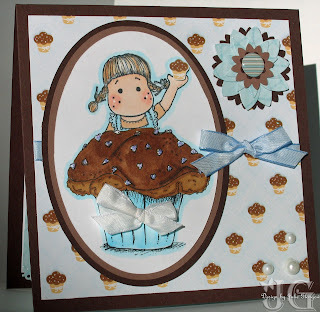 Monday, I told you I would post the "other" cupcake card, the result of my brain fade. I made this card for the Magnolia Down Under Challenge, got it done, and then realized this is for the MAGNOLIA Down Under Challenge. The problem is, there are no Magnolia stamps. The good news is, despite my brain fade, I really like the card. Other notes: Embossing Paste mixes with Close to Cocoa reinker. I really wanted to give the cupcake a sense of having frosting. 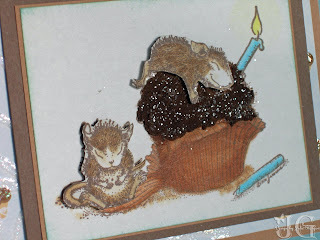 I used Dreamweavers Embossing Paste, mixed with a drop of Close to Cocoa reinker, and spread it over the "frosting" area. I then found that the mice were recessed too much, so I stamped them again, cut them out, and mounted them with dimensionals. 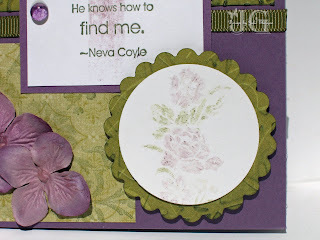 I added a little glitter to the embossing paste while it was still damp to match the frosting on the designer paper. 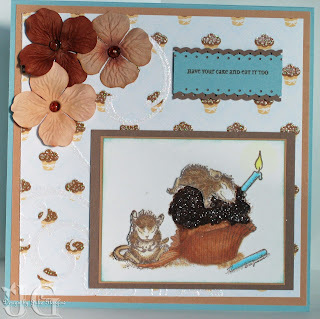 So thanks to Magnolia Down Under for the inspiration for this card, even though it did not meet the challenge. I decided to change pace today and post another picture from my mom's owl calendar. This is the page for June. 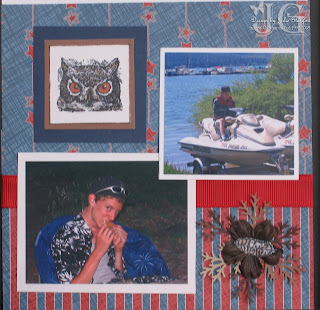 The owl is from a retired Stampin' Up! set called Birds of Prey. I used some paper from my stash. The flower is a Prima with a stamped feather from Birds of Prey, backed with branch punches (Martha Stewart). It is like a little nest. The pictures are of my 17-year-old son. Very soon, my little boy will be an adult. Yikes! There is a fun challenge group out of Australia called Magnolia Down Under. Their challenge this week is simply called Cupcake. 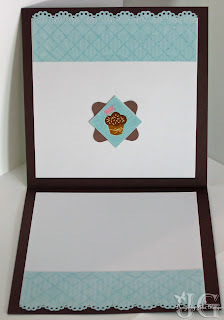 The idea is to use at least one Magnolia stamp on the card with "cupcake" as the theme. This was perfect timing for this challenge. I just recently got the Sweet Collection of designer paper from DCWV. I made the flower by layering paper flowers punched out with the five-petal punch and trio flower punch. I wanted to make it look like Tilda was popping out of the cupcake. I think she would have needed chocolate frosting covering her hair to make this really work well. I still like the effect. I am still trying to get in the swing of decorating the inside of the card. I love the effect, but have yet to go over the top on the inside of the card. 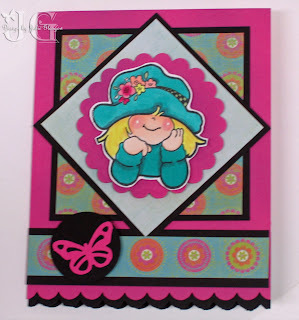 Check back Wednesday to see the first card I made for this challenge. The only problem, I forgot to add a Magnolia image (duh!). I created this card for two different challenges. I actually had 2 ideas, and they just worked so well together, I combined the challenges onto one card. Simon Says Callenge #2: Recycle. Use something, anything that had a use before. I used the cutoffs from my daughter's jeans. 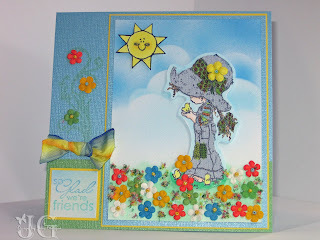 Cute Card Thursday #56 - Floral Fantasy. 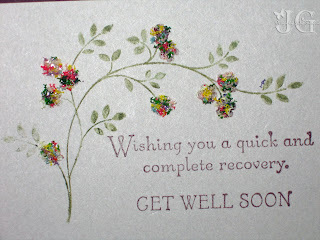 Use any type of flower on your card. Other notes: I used a stencil and airbrushed the grass and sky/clouds with my Copic Airbrush System. For the Cute Card Thursday challenge, I wanted Sarah Kay to be standing in a field of flowers. I used Prima's with beads to give them a center. 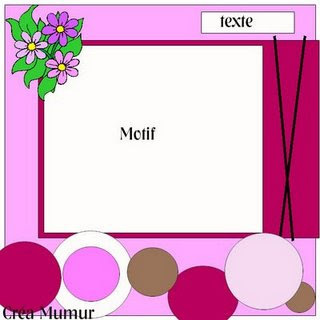 I used Flower Soft to fill in the field of flowers. The hat, bow and overalls are stamped onto and cut our from an old pair of my daughter's jeans. I just cut off the legs of her jeans to make shorts as the knees were gone anyway, and thought this would make great clothing on a card. I used Copics to add some color for the hat band and patches. I hope you have a great rest of your weekend. I must admit, the colors were challenging for me. I had no problem with Sahara Sand, artichoke or chocolate, but the sage threw me. I used my watercolor crayons for my image, and I used sage on the leaves, but you really can't tell. I think the thing that may have redeemed this challenge for me is the Flower Soft. There is actually sage in the Flower Soft. 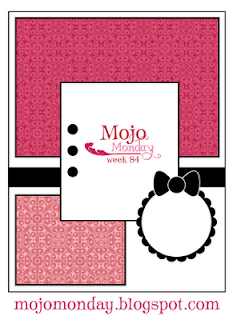 I found my mojo through the Mojo Monday Challenge. 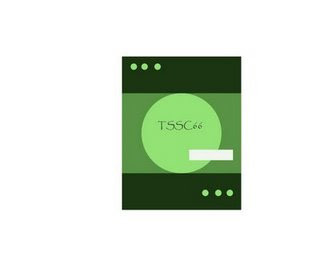 The challenge this week is to create a card using this sketch. I remembered to decorate the inside of the card as well. Nothing fancy, but a little something. If you live in Southern California, check out the store Stamp Your Heart Out. They are in Claremont. They have their own line of stamps that are just adorable. 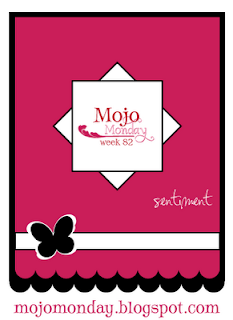 And go check out Mojo Monday. They have great sketches each week to help get your mojo going. Bev is offering some great blog candy to celebrate her blog anniversary. Go check it out.